Judge me. Go ahead. I can take it. That’s part of the deal, right? Judge not, lest ye be judged. But judging comes with the territory. Although occasionally, I’m called into service to judge in a more official capacity. Take yesterday, for example. Sunday, the Schenectady JCC had an Iron Chef style cooking contest between four members of the Jewish community who were cooking against the clock for a panel of judges. One was the director of the JCC, the other was an Israeli restaurateur, and then there was the local food blogger. There was one thing that I had decided early on, and that was that I would not argue with an Israeli where hummus was concerned. But there was another thing about this competition which is worth noting. Judging home cooks is one of the hardest things to do for someone who regularly critiques professional chefs. Home cooking is important. And anyone who cares about food knows that. Since home cooking needs to be encouraged, it’s important for these critiques to steer clear from disparagement. And usually, it’s not a hard thing to do. When invited over to someone’s home, all but the most insufferable critics will delight in the host’s hospitality and gratefully eat everything that is served. It’s simply called good manners. But it’s a bit more challenging when you are called in to be a judge. Especially when the master of ceremonies wants live commentary on your immediate thoughts about a dish. “This needs more salt” or “the raw garlic is overpowering” are the kinds of things that pop immediately to mind, but those aren’t encouraging at all. So you have to dig deep and come up with something honest, on the double. That said, after hearing nothing but good things about their dishes, competitors may wonder why one dish scored higher than another. And that’s fair. I’ve heard before after I’ve judged competitions that participants were left scratching their heads, because they didn’t receive any notes. So, I thought it might be useful after the event to offer some gentle constructive criticism for all the dishes sampled. Including the ones that won. 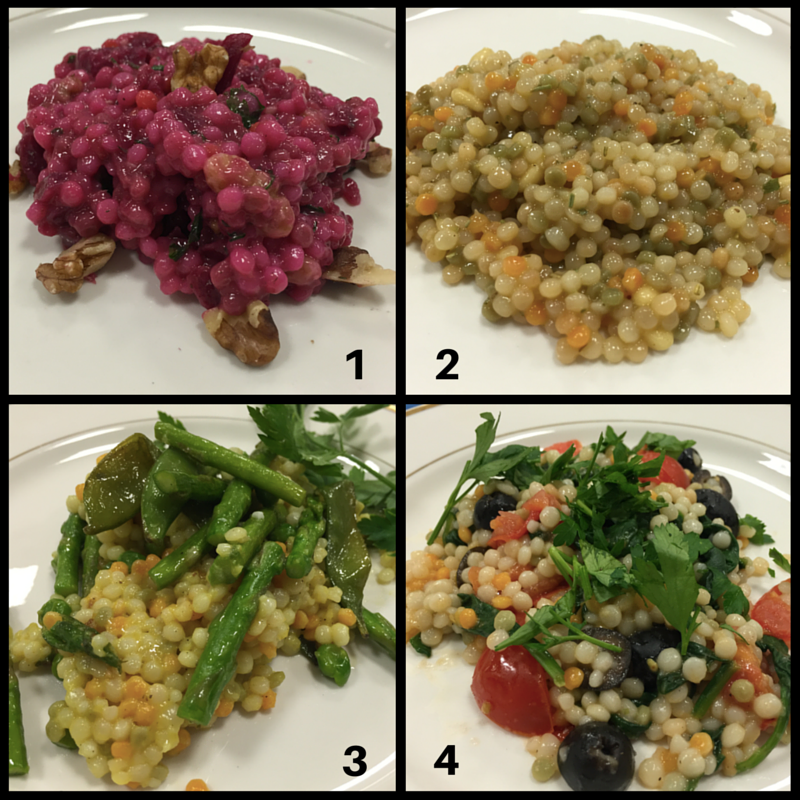 Round one was the Israeli couscous battle. Dish 1 – Beautiful colors. Great composition. It would have easily won if it had been seasoned. Dish 2 – Great aroma, but over-seasoned. Also it could use some visual appeal. Dish 3 – Winner. Great spring dish. A tad underseasoned, and snow peas a tad overcooked.. Dish 4 – Loved the idea, but to work it needed better olives, and finer chopped parsley. Dish 1 – Winner. Hummus was a bold choice. The Israeli loved it. I thought it was too chunky. Dish 2 – Israeli salad. Beautiful. Good knife work. Balanced. Well seasoned. My top pick. Dish 3 – Israeli kibbutz salad. Raw garlic can be overpowering. This needed less. 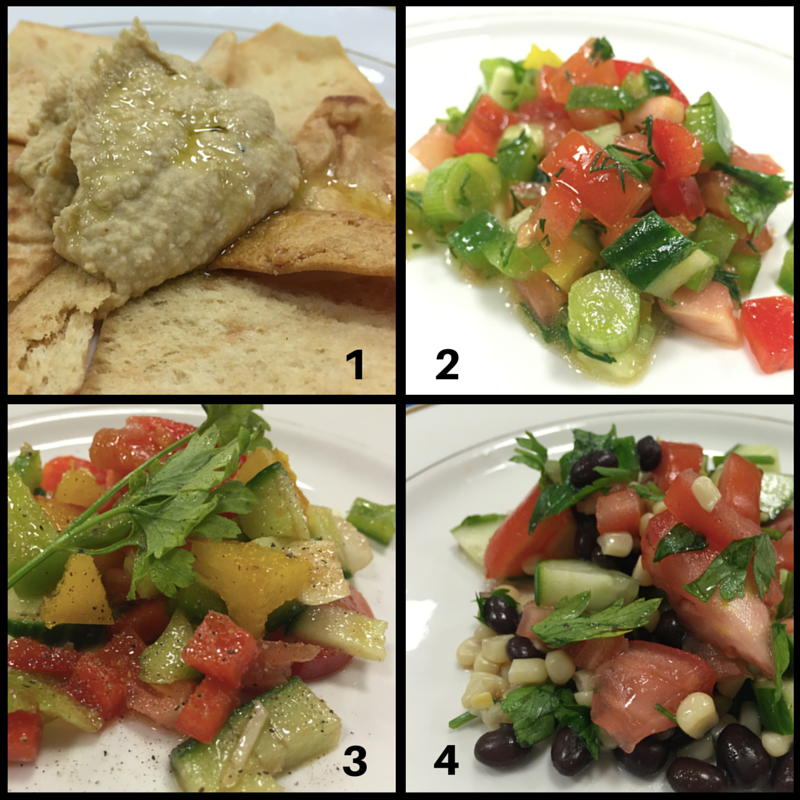 Dish 4 – Israeli salad with a Mexican twist. Big chunks of tomato work best at peak season. The home cook who took first place in the salad and second place in the couscous won the day. And it turns out he was a teenager, besting competitors with years of cooking experience. Bravo. While I may not have been the biggest fan of his hummus, that bold beet couscous was a winner. Okay. Technically it didn’t beat dish number three, however it could have with just a little bit of salt. The beets, walnuts, and dill really played well together. I appreciated the thought that went into the dish, and the daring of presenting something so different from the pack. I also appreciated the sweet pen/stylus and bottle of Israeli olive oil I got for participating. It was a lot of fun, and I hope to be invited back next year. I wish I could have stayed for dinner, but tomorrow is a crazy awesome Yelp Elite Event at Cider Belly Doughnuts, and those things don’t plan themselves. Plus there is Tavern Time this Thursday. This week is going to fly by. I just hope I don’t get whiplash. Do you mind if I put a link to it on our website/FB? Thank you. I don’t mind at all. I appreciate the kind words. Please share the recipes….congratulations to the winners. Is the Israeli restauranteur’s place in this area? I miss some of the NYC options for Israeli food!